The Knowing the Bible series is a new resource designed to help Bible readers better understand and apply God’s Word. Each 12-week study covers one book of the Bible and is made up of four basic components: (1) Reflection questions designed to help readers engage the text at a deeper level; (2) “Gospel Glimpses” highlighting the gospel of grace throughout the book; (3) “Whole-Bible Connections” showing how a given passage connects to the Bible’s overarching story of redemption culminating in Christ; and (4) “Theological Soundings” identifying how historic orthodox doctrines are taught or reinforced throughout Scripture. With contributions from a wide array of influential pastors and church leaders, these gospel-centered studies will help Christians cherish the message of God’s grace on each and every page of the Bible. 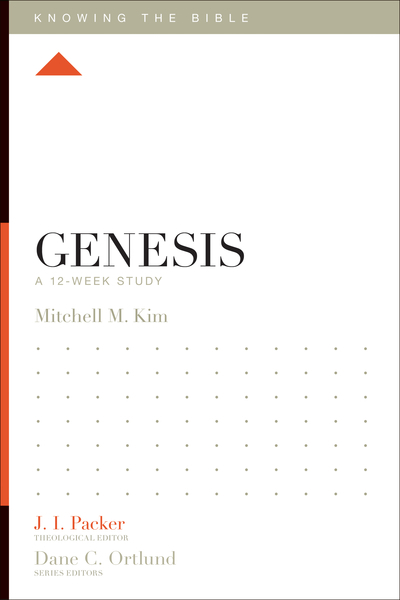 In this study of Genesis, pastor Mitchell Kim leads readers through the first book of the Bible, uncovering the meaning of the text while exploring important applications for everyday life. From explaining the true significance of the creation account to investigating God’s gracious calling of the nation of Israel, this book highlights how the storyline of Genesis foreshadows and connects to the good news about Jesus, the long-awaited “seed of the woman.” With penetrating exegetical insights and thought-provoking application questions, Kim has crafted an invaluable guide for those seeking to better understand this foundational book.